With an ever-deepening housing affordability crisis, families are growing more open to creative solutions while politicians balk at addressing the issue or propose the occasional Hail Mary. 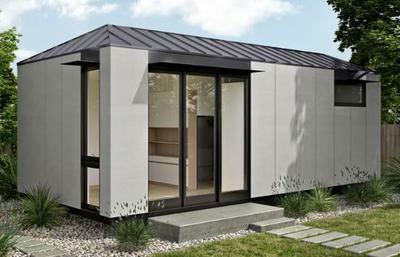 That’s why prefab manufacturer LivingHomes has unveiled the LivingHome AD1, a versatile accessory dwelling unit (ADU) that can act as a spare room in the backyard—or stand on its own as a tiny home. Coming in at 400 square feet, this unit squeezes every inch out of its undersized frame, packing a bedroom, bathroom, kitchen, and living room into the compact space. 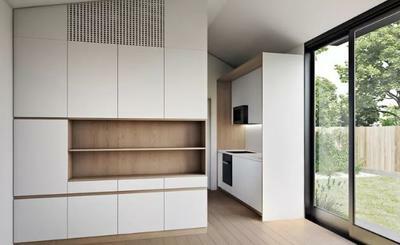 As add-ons to existing single family homes, the AD1 can serve as an extra room for a family member or two—hence the “granny unit” nickname ADUs have received—or be rented out at affordable prices. The dwelling is advertised as a sustainable rental unit, thanks to its LEED-certified construction in addition to high efficiency lighting and HVAC system. LivingHomes also offers three different finish packages for both the interior and the exterior of the AD1, providing for a range of customizable options. ADUs are in vogue as a potential means of chipping away at the affordability crisis, especially in California, after Governor Jerry Brown signed a bill easing restrictions on such units in 2016. But while California might be the state most amendable to the new AD1, the unit is available to residents in every state regulation-depending, though shipping costs will vary. The AD1 starts at $99,000 for the base units, a price that excludes site work costs and permit fees.